The Halifax Greek Fest has become famous for providing visitors with one of Halifax’s best Donairs. It’s all in the top secret recipe! Handmade, marinated pork skewers grilled to perfection. A marinated and grilled chicken variation of our popular pork skewers. 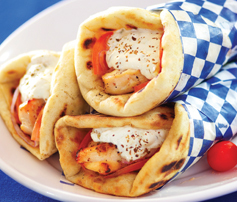 Marinated, grilled chicken wrapped in a large pita filled with onions, tomatoes & tzatziki.